Mr Jones captured everything that happened in the city for five decades and when he died in 1967, his family donated a vast collection of 34,000 prints to the Boston Public Library. 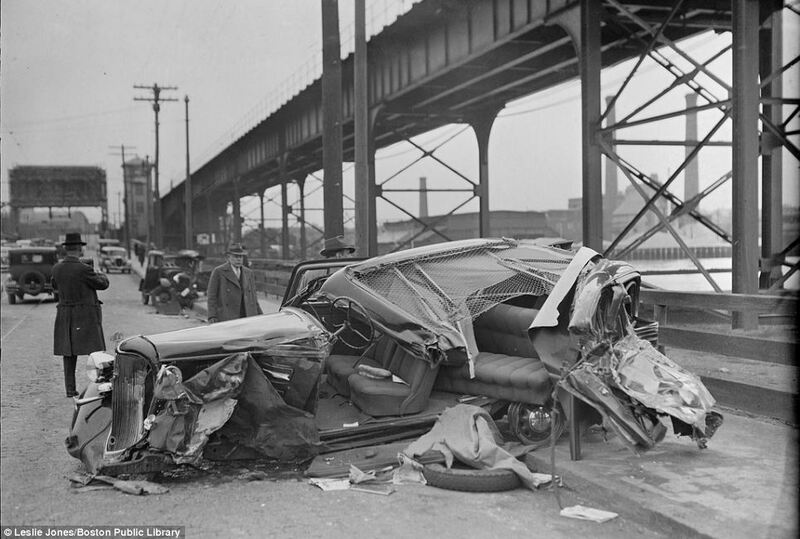 They included these fascinating photos (not ALL of them) of vintage car wrecks from the great motoring boom. Motor cars became affordable to the masses for the first time in the 1920s. 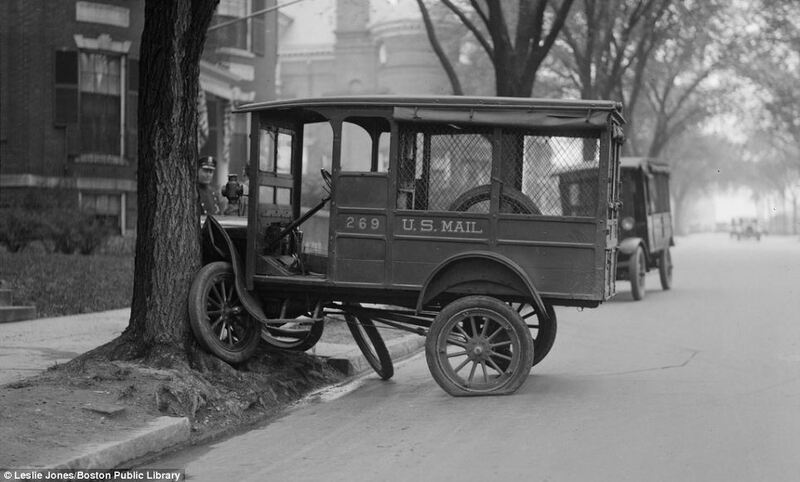 By the end of the decade a Model T Ford cost $298, just a fraction of the $1,200 it cost in 1909. 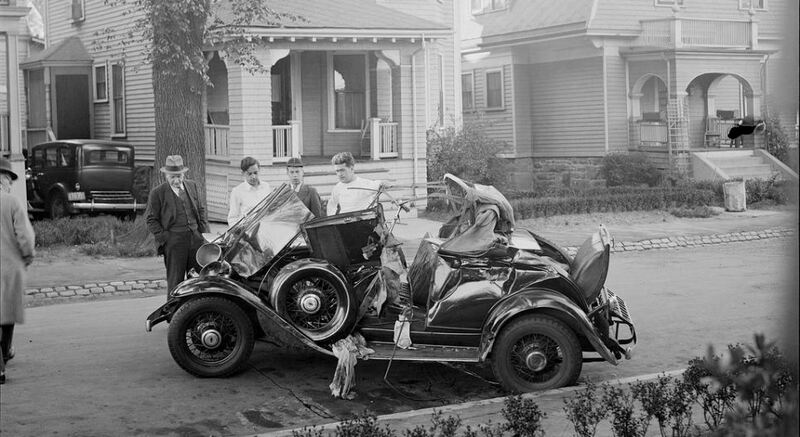 The introduction of hire purchase also made it much easier for members of the public to buy cars and by 1929, 20 per cent of Americans were on the road. 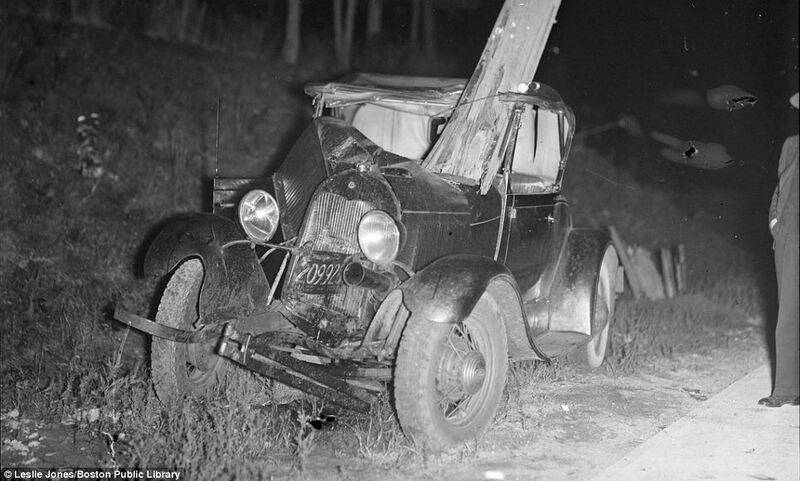 Ford, Chrysler and General Motors were all competing for the boom in business and by the time the depression hit in 1929, Ford was producing more than one car every minute. 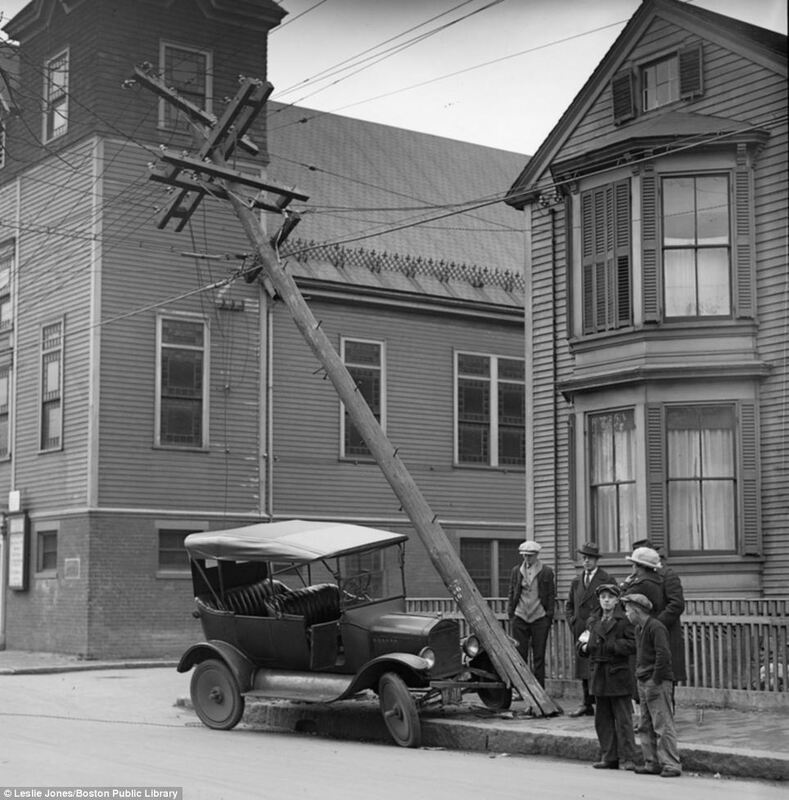 Technology meant these early cars were capable of achieving speeds of up to 50 miles per hour – but safety measures were nowhere near as advanced as they are today. 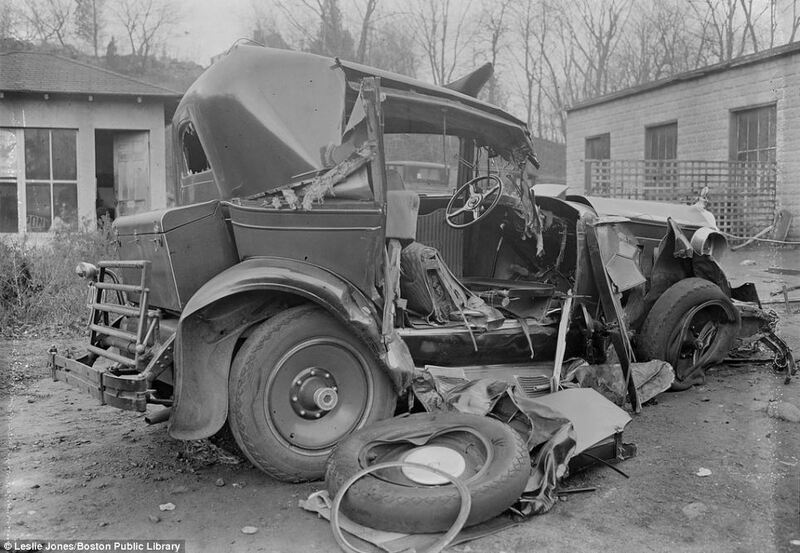 Add in the fact drivers didn’t need to pass a test before they got behind the wheel, and it’s easy to see why accidents were frequent and often spectacular. 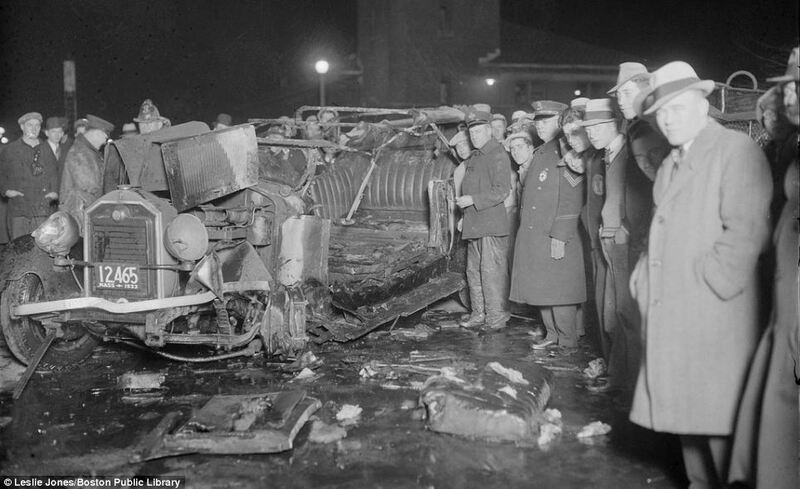 Crowds pose for photographer Leslie Jones alongside a mangled and burnt out wreck in Boston in 1933. A police (NAZI?) 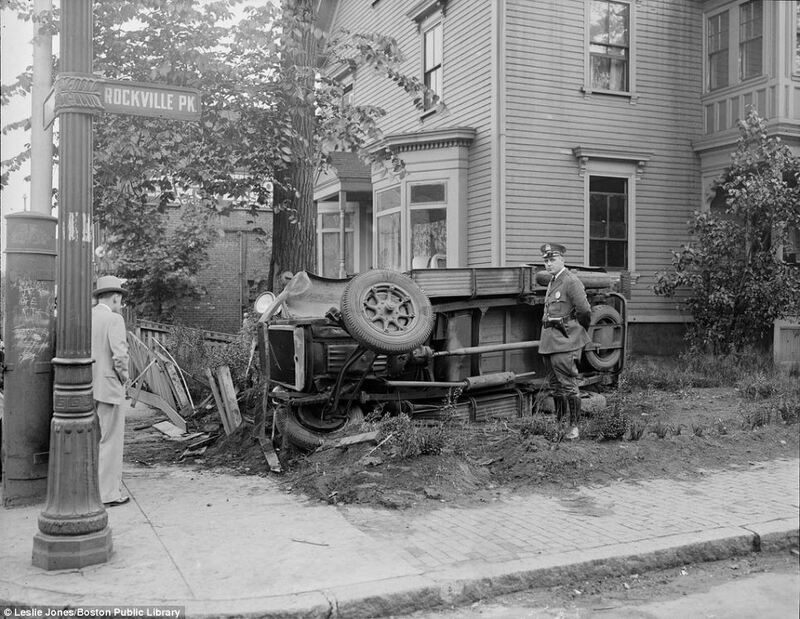 officer poses next to a car that flipped over manoevring around a corner in Roxbury, Massachusetts in 1935. This truck stood no chance when it came into contact with a tree on a rural Mass. 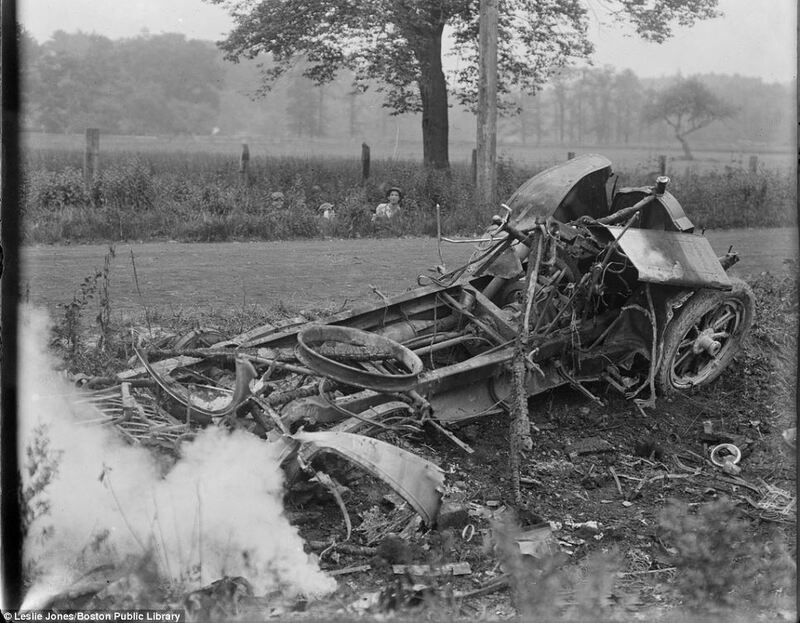 road, disintegrating on impact – leaving just the steering wheel intact. 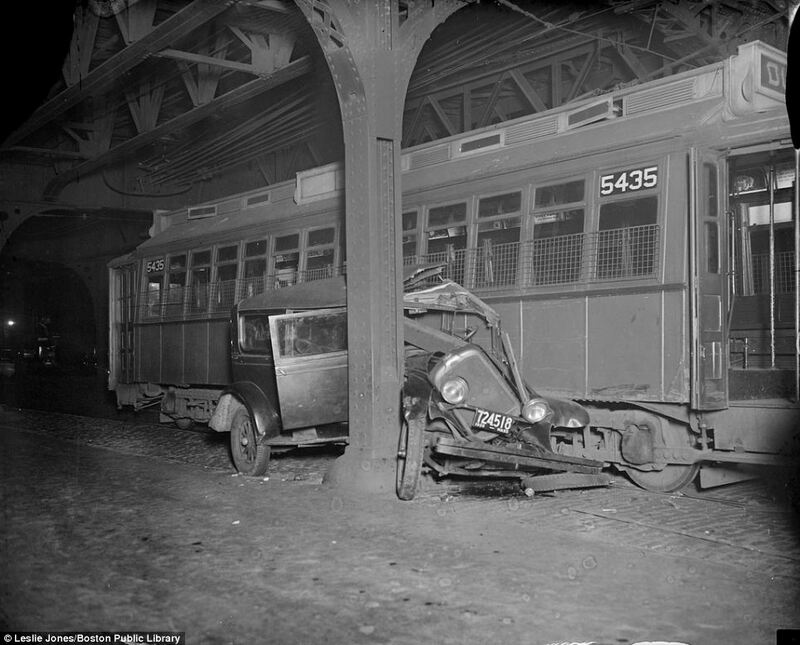 This car came out loser in a battle of wills with a trolley bus on Boston’s South End in 1932. 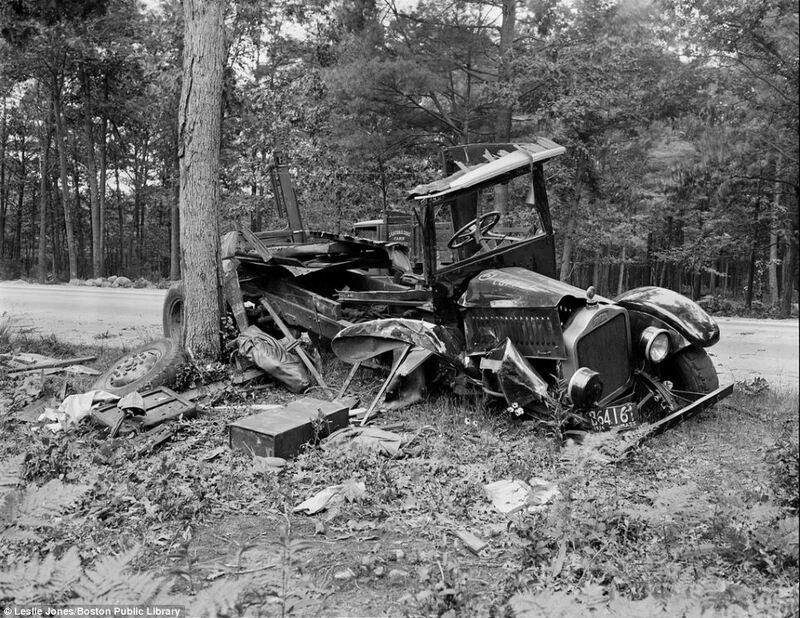 Children peer out of the undergrowth as photographer Leslie Jones captures a nasty wreck smoulding by the side of the road in Hingham. 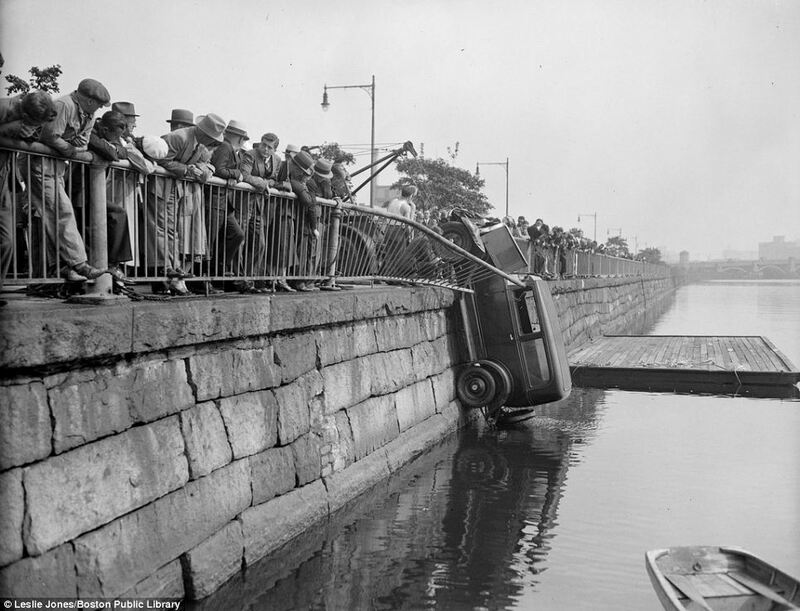 Crowds watch in awe as a car is winched out of the Charles River in Cambridge, Mass in 1933, close to the Harvard University campus. 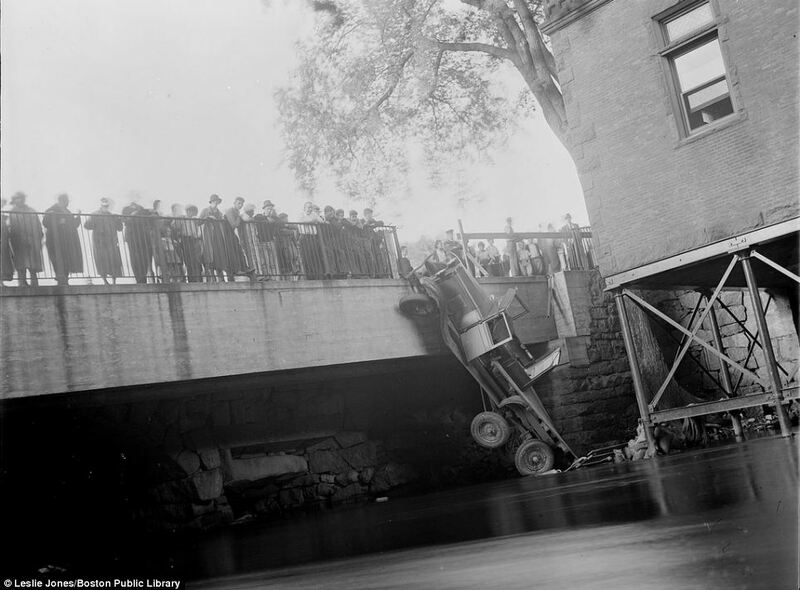 Taken in 1934, this photograph shows a truck balancing on a bridge in Dorchester by just one wheel. Workers from the Walter Baker & Co chocolate factory rushed out of the building in the background to watch. 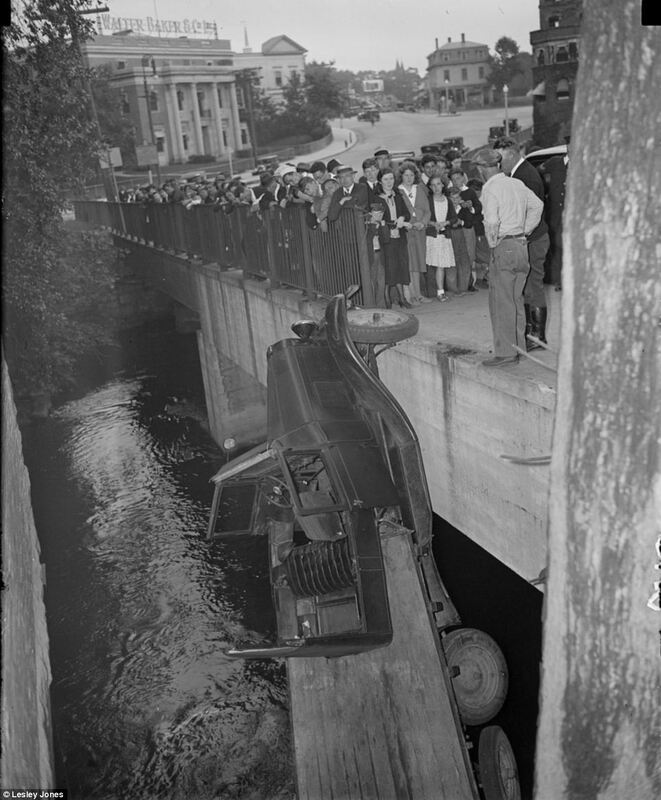 The driver of this car was unlikely to have survived this collision. 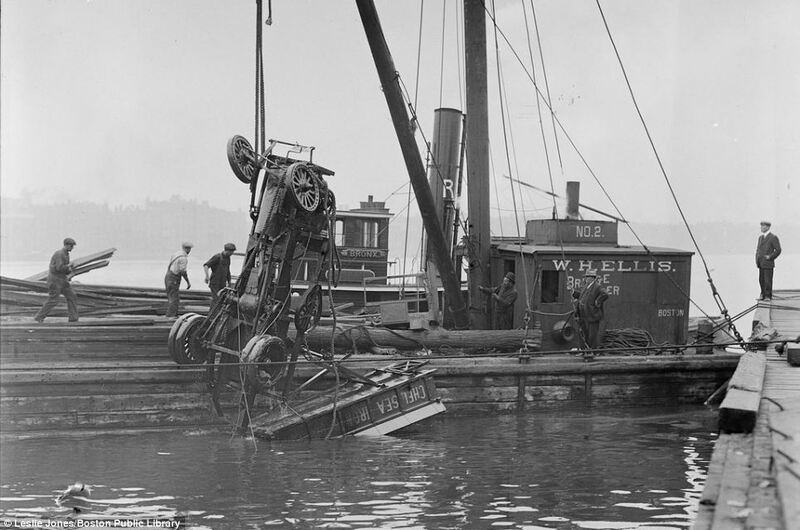 The wreck is wrapped entirely around a tree, which sits in the driver’s position. 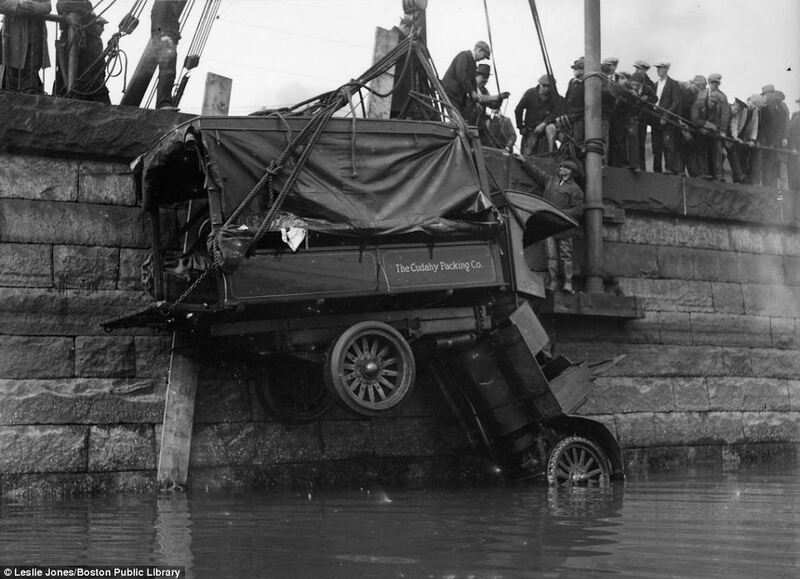 The shell of a truck is pulled from the Charles River after it careered off the Harvard Bridge. 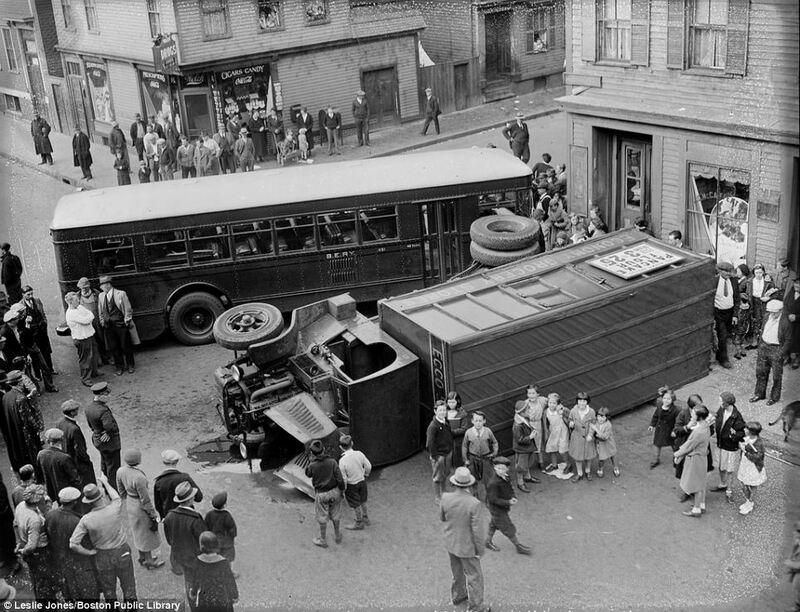 Photographer Leslie Jones had to part crowds of onlookers to capture this accident in downtown Boston. 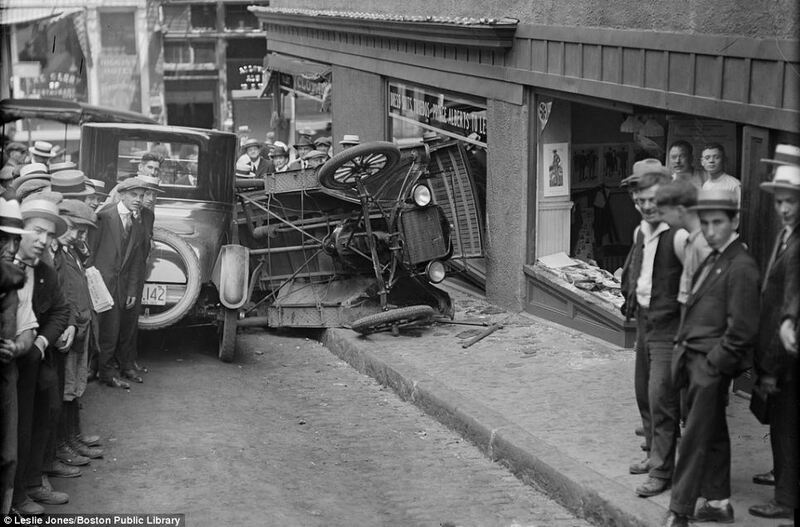 An out of control car collided with a shopfront, smashing windows and ending up on its side. Local businessman Byron Harwood and Byron Grover were hurt when their car collided with a bus in Waltham, Mass. in 1921. 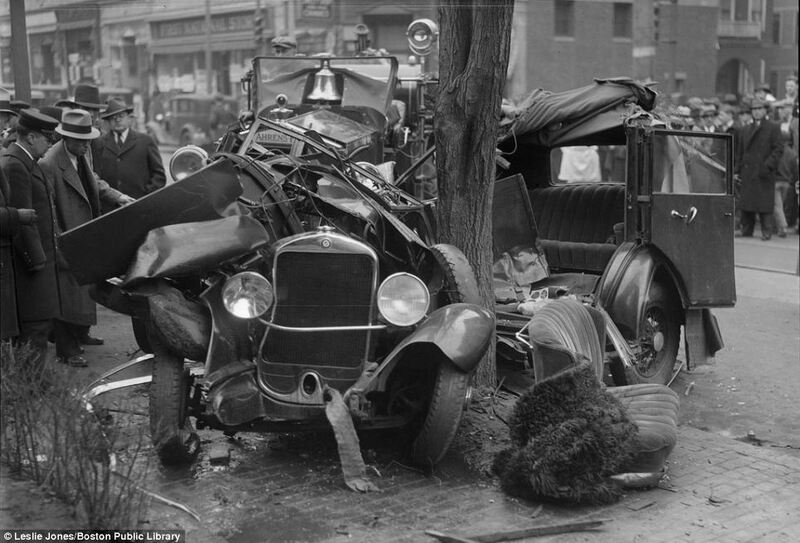 They were lucky to survive this nasty looking wreck. Their car certainly didn’t. 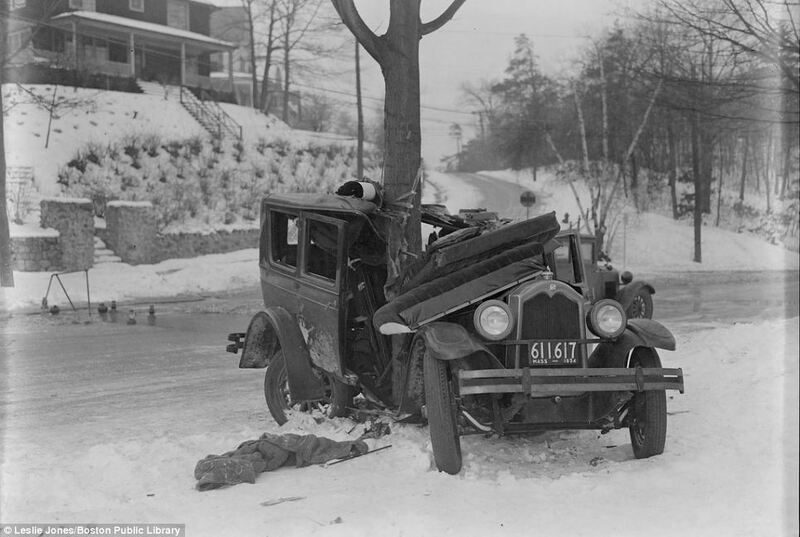 Taken in 1934, this photo shows a car that skidded out of control on ice-covered roads and wrapped around a tree in Auburndale, Mass. 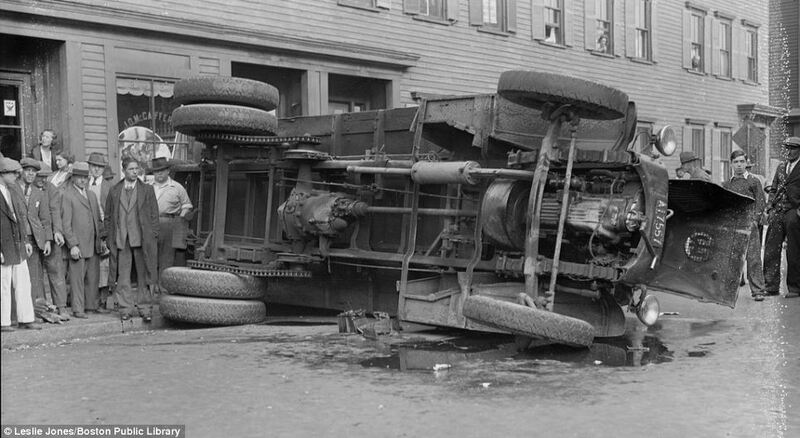 A truck collideded with a bus and flipped over in south Boston, stopping just before it smashed into a cafeteria storefront. 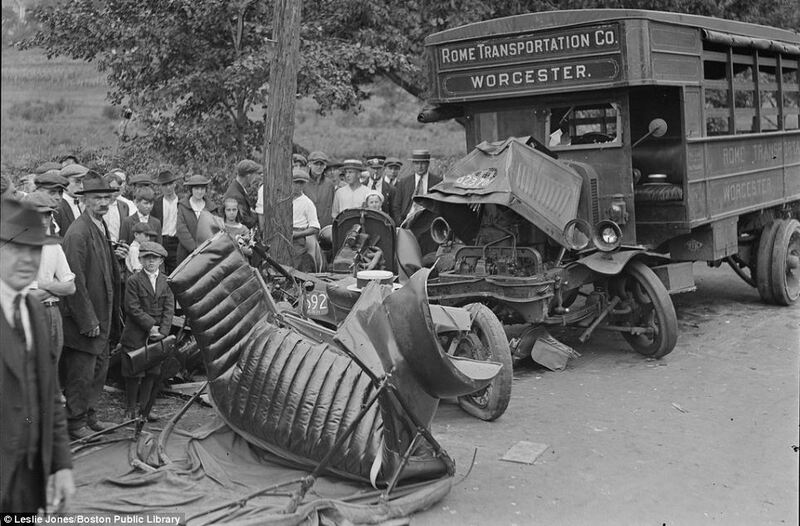 Another view of the same accident shows eager children posing with the upturned truck. 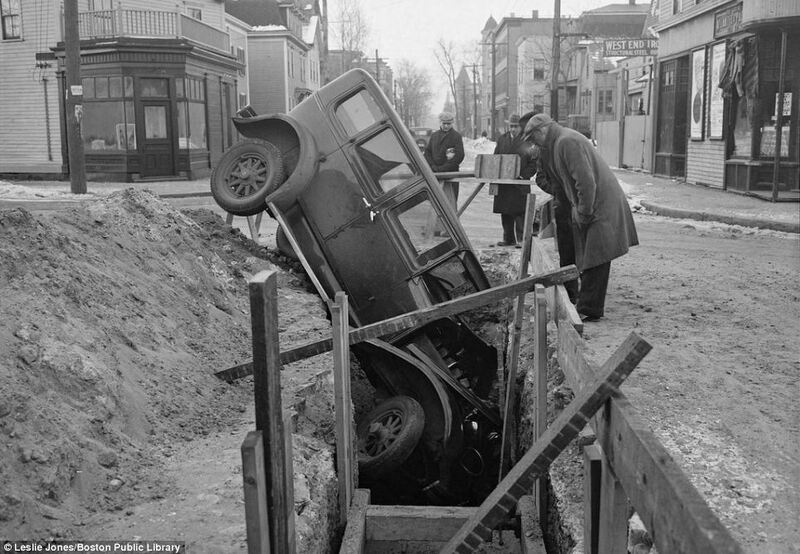 It also demonstrates how close the vehicles came to nearby buildings. 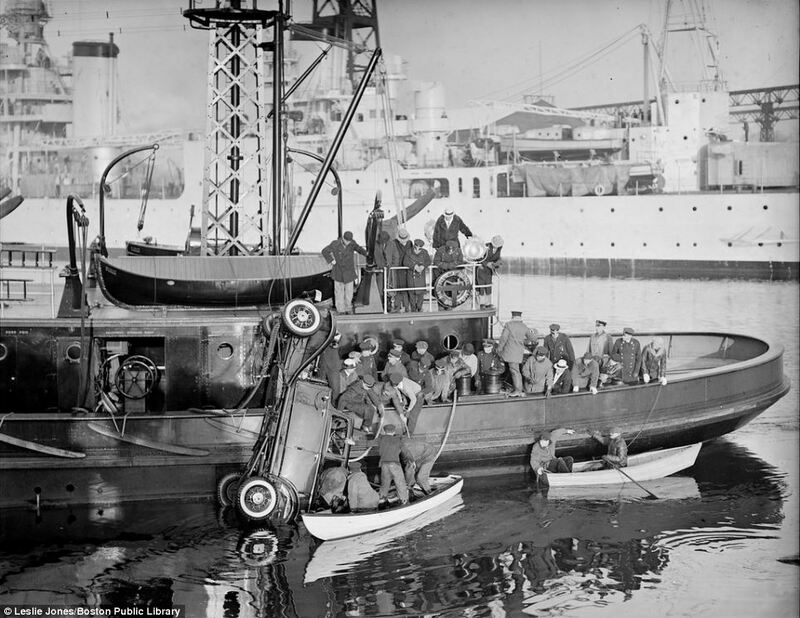 A Cudahy Packing Co. truck is hauled out of Fort Point Channel, which separates South Boston and downtown Boston.